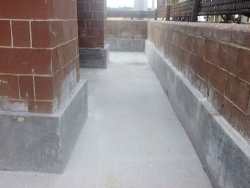 Durosil DR11 is an acid proof concrete, supplied in kit form. It does not need to be laid on a dry substrate, so downtimes are greatly reduced. Can be laid directly on both green and wet concrete. Can be laid over existing brick and tile finishes, its excellent adhesion to ceramic earthenware means that leaking bunds can be repaired by overlaying with 40mm Durosil DR11. Can be laid on acid attacked concrete after removal of loose material. No need to wait 28 days for concrete substrates to dry out to <10% moisture content. Quick to lay, using similar techniques to laying a standard concrete floor. No dangerous resin fumes from the product. An independent test house, found that after 56 days in acid a Cold Crushing Strength of 19.5 MPA in sample air-dried cubes increased to 29 MPA. Also available; Durosil DR 6 mortar for laying acid resistant brick and tiles. 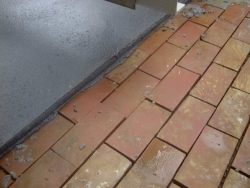 A deterioration over time of the mortar used to fix acid resistant clay bricks, and the other a sudden catastrophic failure of an acid-tiled floor. Down-time was the crucial factor. For many years sulphur pits have been constructed of concrete and lined with acid-resistant brick, often laid with a furane resin mortar, a smelly and possibly carcinogenic compound. Differential rates of expansion between the civil concrete and the brickwork have frequently caused the latter to collapse, leaving the civil concrete open to attack by sulphur fume, or sulphuric acid in the event of water leaking into the pit. 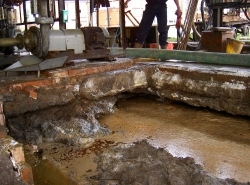 Durosil products are increasingly being used to solve these problems. 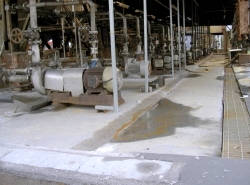 Durosil concrete and mortar have been used by Shell UK and Adgas in Abu Dhabi both for speed of application and complete resistance to the deleterious effects of sulphur in the pits. They represent a major advance in the repair and maintenance of sulphur pits on oil and gas plants anywhere in the world. For any technical or purchasing advice please fill in the form below and we will get back to you.